To help you understand our program, use the links below for information about what we have to offer our Atmospheric Science majors. At the bottom is a link to the admissions department so you can get started and apply to UofL. 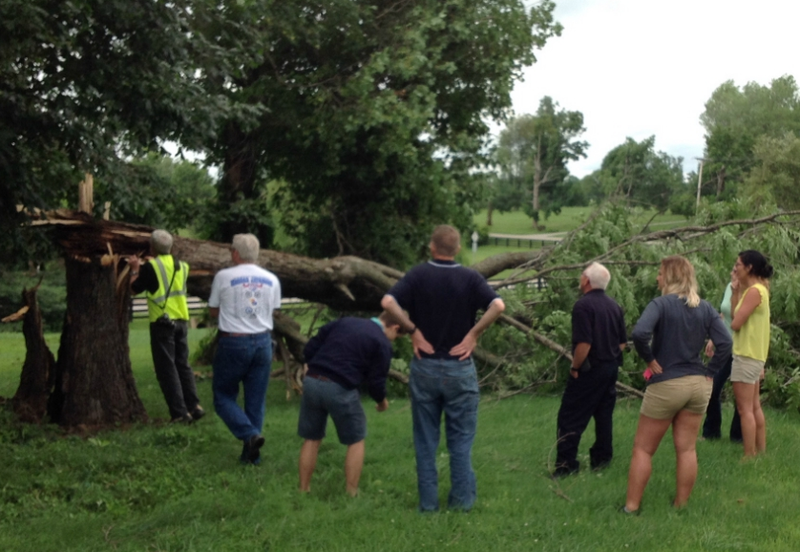 Storm survey in Shelby County, June 27, 2015. Peak wind speeds were estimated at 65 mph. UofL Atmospheric Science students have many opportunities to help the National Weather Service, including generating geographical data files (KML files) with geotagged photos on storm surveys like this one. From left to right: Prof. Bill Fountain (U. Kentucky Dept. of Horticulture), Randy Baker (head meteorologist, UPS), Brian Greene (U. Illinois), John Gordon (Louisville NWS Meteorologist-In-Charge), Paul Whitman (Shelby Co. Emergency Manager), Jessica Dobson (WKU), Melissa Dye (background, UofL), Christina Andress (foreground, UofL).